Hello readers! I’m sure you’ve noticed that Christmas is actually not that far away so I thought I’d share the first of my Christmas gift guides with you. 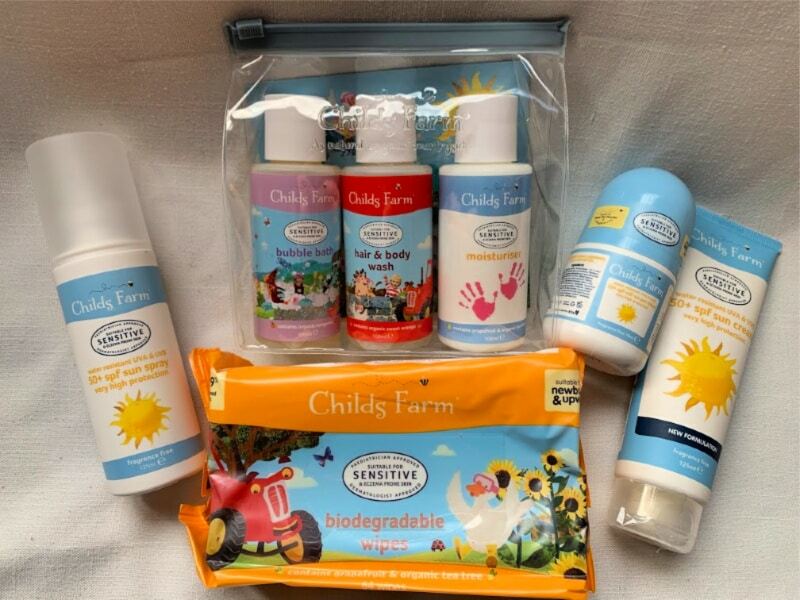 These gifts are available from one of my favourite online gift stores, Prezzybox. 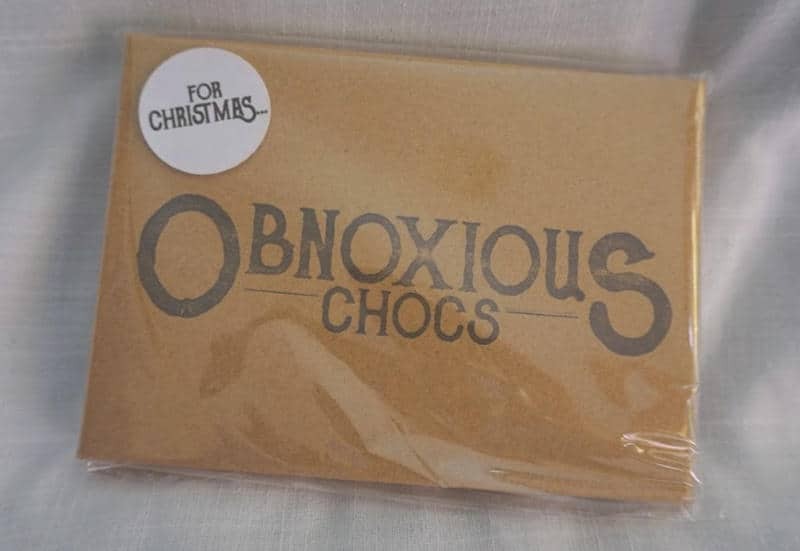 I’ve been a huge fan of theirs for a few years now as not only are the Prezzybox team super lovely to work with from a blogging perspective, but they also have a wonderful range of gifts for Christmas and pretty much any special occasion really. Whoever you are buying for, I would strongly recommend you visit Prezzybox and have a browse at what they have on offer. I suspect you will really enjoy shopping with them. I’ve picked out a few gift ideas for both men and women from Prezzybox that I think will make great presents for friends, family or any secret Santa’s you might be taking part in this year. Lets see if I can inspire you..
Take the gift of bubble bath to a whole new level with this luxurious Prosecco bathing gel. If you know someone who loves a glass of fizz they will love adding this to their bathroom. The stylish vintage bottle makes for the perfect presentation and your gift will allow the favourite tipple to be enjoyed in a whole new way. 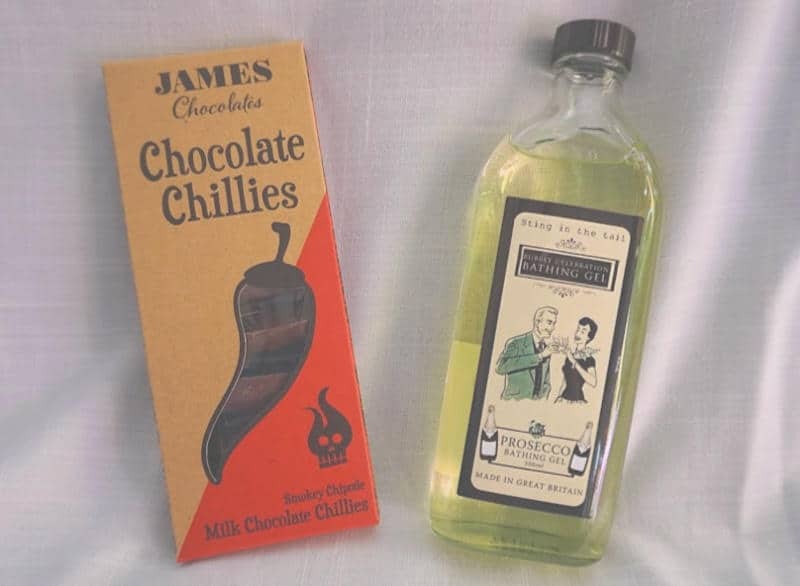 Only a chosen few now just how good chocolate and chilli taste together but if you happen to have this kind of foodie in your life they will love that you bought them these milk chocolate chillies. They are gorgeous dark chocolates shaped as chillis blended with smoked chipotle chilli. The chocolate flavour is deliciously followed by a special chilli kick perfect for those who like a little heat in all their food. 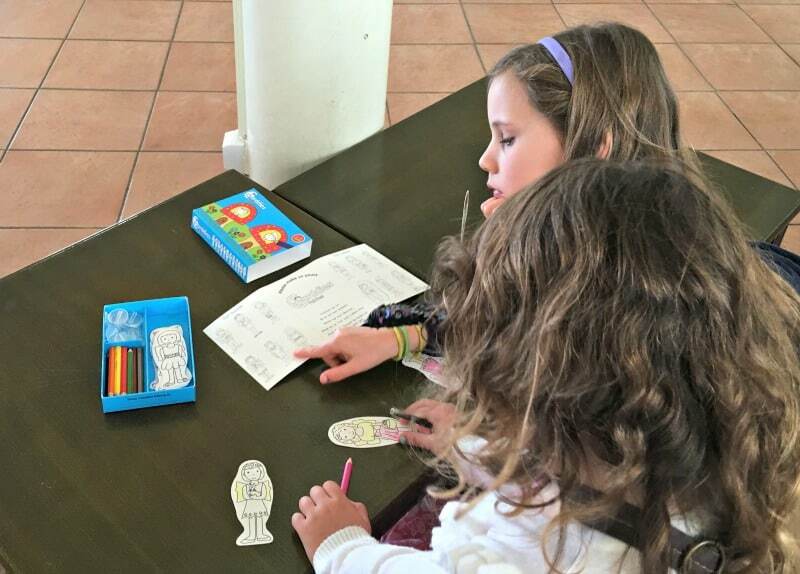 Colouring therapy has become very popular in recent years and it’s showing no sign of going away. 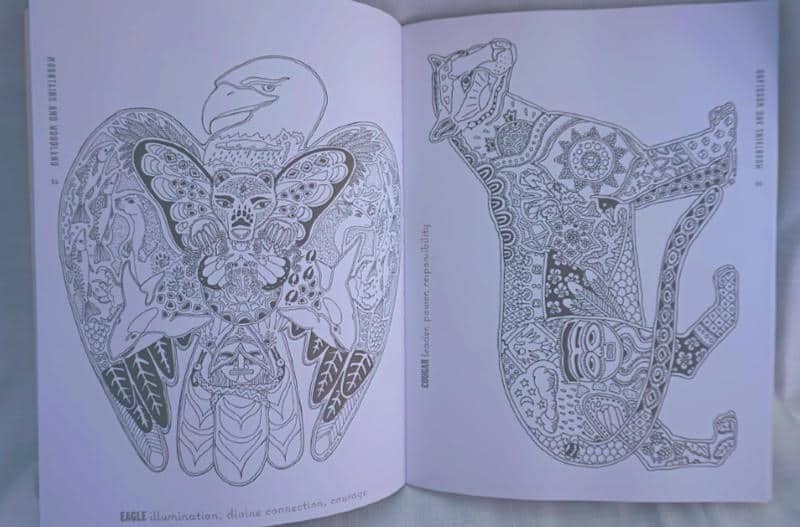 This ‘Colour Yourself to Calmness’ colouring book is perfect for someone who needs a little stress relief in their life or enjoys things like mediation and relaxation. The book is packed with gorgeous illustrations to colour and is also hardback to make using it even easier. When I saw these Obnoxious Chocolates I cannot lie, the first person I thought of was my husband. Whoever has picked him in secret Santa this year, these would literally be perfect for him. With phrases like ‘Stuff this’ and ‘Wake me when it’s over’ they are the perfect stocking filler for the Grinch in your life. I love coffee and I’m pretty sure that you know someone who loves coffee too. 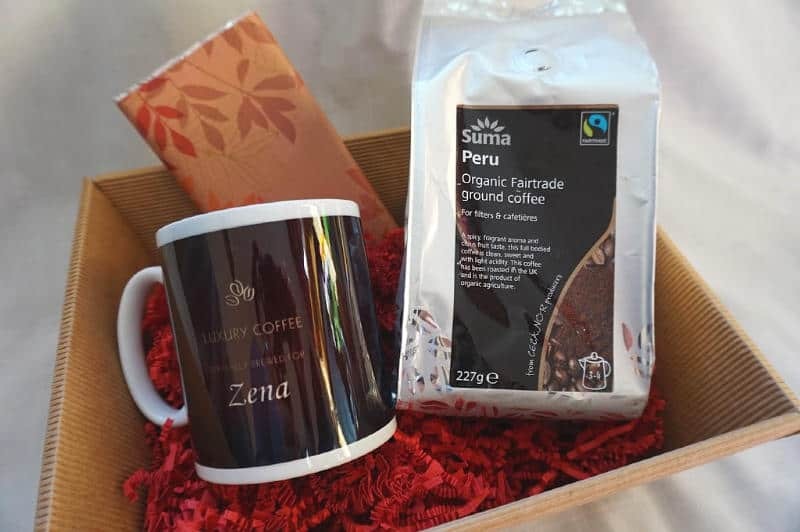 This personalised coffee hamper will be the perfect Christmas gift for them containing 2 packets of delicious fair trade ground coffee, a packet of Divine coffee chocolate and a personalised mug to enjoy it all with. It’s a gift they can keep on enjoying, and it’s one of those work mug’s that should never go missing! Both PREZZYBOX and I love to give a little back at this time of year which is why I’m super excited to announce my latest giveaway. If you would like to get your hands on this lovely Personalised Coffee Hamper either for yourself or perhaps as an extra special gift for someone we are giving you the chance to get your hands on your very own. All you need to do is enter via the Rafflecopter below. Good luck! Competition ends 9.12.18. other T&Cs apply. I am a coffee fiend so I would love to win this prize and it would be a treat to myself to get me through Christmas haha! Although I might share if you ask nicely! I would keep the chocolate for myself and give the mug and coffee to a friend who has a coffee machine (as I don’t). I have never owned my own personal coffee cup so I always have to have what is left. Usually the stained cracked one. This would be put pride of place. I’d love to winches for my sister in law’s Christmas Pressie – after a year of behaving herself as a new mum – the ‘milk taps are off’ and she can finally have some caffeine! I would love to win this for my husband he is a real coffee lover and this would be a lovely surprise and treat. I would like to win this for my mum,she loves her coffee and this would be perfect for her. I’d love to win this prize for my mum because she loves her coffee. I would love to win this prize to give to my partner who is a big coffee lover! For my wonderful best friend who does so much for me and my daughter. She’s absolutely busy and stressed organising her daughter’s wedding and this would be such a fabulous pick me up for her. Perfect for my daughter, Hannah, she loves her coffee and makes the best brew ever! This would be perfect for my mum who loves her coffee – it’d make a great gift! My wife as she bathed, wiped, fed and cheered me up whilst I was recovering from falling off a roof. Start work on Friday so her Florence Knightingale period is now complete. Love gifts like this, I would give it to my sister-in-law. If I were to win this I would share with my friends when we have our coffee and cake mornings. A perfect gift for my partner! He always takes coffee to work. I’d love to win this prize for my husband. He’d loves a decent mug of coffee. This would be his ideal gift. I would love this as I love coffee and would keep it for myself. Ive had such a horrible time of it, that i would treat myself, and coffee is one of the big loves of my life, so yes, why not ! I am a utter coffee nutter love a nice cup each day. It’s not just wanting to win, I need to win. Must have coffee! My boyfriend is a massive coffee nut, I’d love to give this to him! I’d gift it to my father in law, he loves a cuppa coffee! I’d love to win this for my sister as she is such a coffee addict so i know she would love this hamper as a gift! I’d love to win this for my fiance. He is a big coffee fan and I’ve been trying to find him something coffee related for christmas! My middle names are Coffee Queen and I try to have nice coffee and coffee products in the home for the family to enjoy. I would probably give this to one of the boys who would appreciate it. this would be ideal for the hubby he really loves a good coffee, so this would go down a treat. I love the obnoxious chocolates for a colleague at work, they’d be perfect for her! My colleague would also love the coffee hamper, she survives on it! I would love to win, my brother in law is a major coffee lover and hard to buy for at xmas so this would be perfect!! I’d love to win it for my mum who is coffee obsessed! I would give it to my brother who lives on coffee. I don’t know whether I should encourage him though! I would love to win this for Hubby as he is a big coffee drinker and this would be very useful for him. My husband is absolutely a fan of all things coffee. I would love to surprise him with this. I would give this to my Coffee Addicted Sister. I call her CAS. I hope she will make me the odd mug or two to share a natter over. I’d gift this to my husband for our first Christmas as a married couple. We are coffee obsessed and he’s always moaning about not having luxury coffee because I won’t justify the costs! My husband love his coffee strong and black, made in his own cafetiere first thing in the morning. I would love to give this personalised coffee hamper to him as a Christmas treat. I would keep this for me as I love coffee and it would be my Christmas treat. i’d love to win this to give it to my husband – i bought him some new coffees last year for Christmas and he loved it – so bound to love this too! I would either like to win for myself or for my carer who comes in to help me every day, I love coffee! Fantastic give away, thank you and prezzybox for the chance. For my partner, she loves coffee and I don’t like it at all. I’d gift it to my coffee loving friend Paul for Christmas. I’d love to win for my mum, she loves cofee! I’d give it to my best friend my other half who has had a rough couple of years but we’re now starting to come out of it so would love something to cheer him up. Thanks. I would love to win as this would be a perfect Christmas gift for my dad who is always giving me lifts everywhere! My husband and I love our coffee so I’d like to win this for him. It’ll be especially needed this year as we’re having baby no. 3 on 23rd December! I would love to win and give the prize to my Dad who is so very difficult to but for! This prize would be perfect for him! I’d love to win this! I’ve been racking my brains for a gift for my godmother and this would be PERFECT for her! Because I love Coffee and I would give it to my mum. I would love to win this for my dad, he loves coffee and I love treating him every now and then to some. This would be a lovely surprise for him. My son & myself are both Coffee drinkers. Would love to win this to share. I’d love to win this for my dad – he’s a big coffee drinker and i’m really struggling for ideas for Christmas for him! I would love to win this for my sister as she has had builders working in her house since May! She loves her coffee and needs a little treat. I would love to win for my mum, she loves her coffee and she deserves a treat for always being so supportive. I would love to win because I love coffee and I would keep the prize for myself. I would love to win for me and my fiance, we don’t ofter treat ourselves this would be amazing! This would make a lovely present for coffee fan. I would love to give this to our lovely next-door neighbour, who will, as he has for the last 10 years, be working Christmas Day as a nurse. I know people do, but he’s volunteered so that people with families can get a chance to have a day off. His family live miles away so he doesn’t see them very often and they certainly don’t think to ask him for Christmas. We have asked him round but he won’t come. He will also do anything for you no matter what shifts he’s on and will only take “baking” as a payment, luckily baking is a hobby so making another pie/crumble/extra set of mince pies isn’t too hard. I’d share it with colleagues. I’m afraid I would keep this for myself. Great coffee is something that I am just crazy about. My husband loves coffee. If I was lucky enough to win I would give this to him as a surprise present. Just taking 15 minutes during the day for a good cup of coffee maintains my sanity in this mad world. Great quality and veryyyy desirable, thanks. I would give it to my teenage soN he has trained as a lifeguard and needs to get up for a 6 O’clock shift!